The overthrow of Saddam Hussein’s regime became official U.S. policy in 1998, when President Clinton signed the Iraq Liberation Act – a bill passed 360-38 by the House of Representatives and by unanimous consent in the Senate. 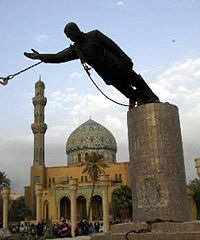 The law called for training and equipping Iraqi dissidents to overthrow Saddam and suggested that the United Nations establish a war-crimes tribunal for the dictator and his lieutenants. The legislation was partly the result of frustration over the undeclared and relatively unheralded “No-Fly Zone War” that had been waged since 1991. Saddam’s military repeatedly fired on U.S. and allied aircraft that were attempting to prevent his regime from destroying Iraqi opposition forces in northern and southern Iraq. Support for the war extended far beyond Capitol Hill. In March 2003, a Pew Research Center poll indicated that 72% of the American public supported President Bush’s decision to use force. According to interrogations conducted after the invasion, Saddam’s own generals believed that he had WMD and expected him to use these weapons as the invasion force neared Baghdad. The war in Iraq was authorized by a bipartisan congressional coalition, supported by prominent media voices and backed by the public. Yet on its 10th anniversary Americans will be told of the Bush administration’s duplicity in leading us into the conflict. Many members of the bipartisan coalition that committed the U.S. to invade Iraq 10 years ago have long since washed their hands of their share of responsibility. We owe it to history – and, more important, to all those who died – to recognize that this wasn’t Bush’s war, it was America’s war. Mr. Knott, a professor of national security affairs at the United States Naval War College, is the author of “Rush to Judgment: George W. Bush, the War on Terror, and His Critics” (University Press of Kansas, 2012). Published March 15, 2013 at The Wall Street Journal. Reprinted here March 21, 2013 for educational purposes only. Visit the website at wsj.com. 1. What is the main idea of Mr. Knott’s commentary? 2. Ask a parent if he/she thinks Mr. Knott makes a strong case for his assertions about the invasion of Iraq, WMDs and the invasion of Iraq being America’s war. CHALLENGE: Find at least 2 other news stories from media outlets other than FoxNews which support Mr. Knott’s argument that Republicans AND Democrats believed the U.S. should invade Iraq.